I can pinpoint exactly when my worst golfing slump began, as well as the date when I finally escaped the wrenching cycle of ever-worsening performances out on the course. It began shortly after I was elected to be the president of my golf club. It ended shortly after my second term of office came to a merciful close. If you can’t play a round of golf without someone coming up to you and volunteering some new and different complaint about the way things are, it can’t help but affect your concentration and enjoyment of the game. Several past club presidents I know, from not only my club but also a few others, readily agreed that they also experienced similar slumps in their game, from the same cause. Sometimes, however, it’s not so easy to figure out why your golf game goes south on you. It’s even harder to find your way back to a better game. That’s why Jimmy Roberts has done the golfing world a nice favor, by focusing on a topic most of us would just as soon put behind us. His new book, Breaking the Slump (Harper Collins; $24.99 SRP) sets out the issue concisely: Slumps happen. What are you going to do about it? Roberts decided to ask a wide-ranging group of golfing greats, as well as a few others known well from other endeavors, to see how they managed to recover from the bouts of badness that can plague us all. 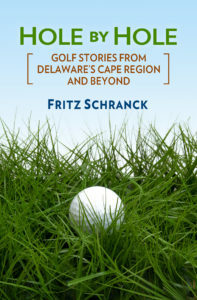 It’s a nice addition to the psychology of golf, not least because the twenty or so stories in the book touch on a wide variety of potential solutions, any one of which may help the readers. For some, such as Paul Azinger, there is more than one source of the downturn. The popular PGA Champion and Ryder Cup captain faced down cancer and other life challenges, such as the loss of his good friend Payne Stewart, but also had a lot of trouble coming back from a steep decline in his playing skills. Azinger describes how hard it was to recover his confidence, and outlines some of the steps he took to do so. He also notes that in his case and for others, an equipment change can also be one of the unsuspected reasons for a slump. Scott Verplank has a daunting history of injuries and physical challenges that have knocked him down on several occasions. Nonetheless, for Roberts he is also one of the great examples of resilience that should help the rest of us recover from our own difficulties. Verplank says we should believe that whatever we once did, we can do again. That light at the end of the tunnel may be farther away than we’d like, but it’s not going to go out unless we let it. 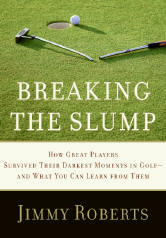 I especially liked the Davis Love III chapter, because it may prove to be the most useful. Davis Love, Jr., was a great golf teacher, and many of the lessons he gave his son are detailed in another fine book, “Every Shot I Take” (Simon & Schuster). The father’s best advice to his now-famous son was to “Try less hard” while out on the golf course, while continuing to work very hard when on the practice range. Pressing while playing will keep you tense, and there are few things worse for your game than the inability to relax. Roberts also describes a bit of his own golfing history, which includes a slump or two that he describes with more good humor than many golfers might bring to the subject. As he says, in his position as a sports broadcaster he plays more than most, and less than he’d like. Despite working diligently to achieve a sterling low handicap, however, Roberts has had his own awful moments, which eventually inspired him to write this book. In other words, something good can come from something bad. Thank you, Jimmy, and good luck with your slump. It won’t be forever.